Home » Articles » What would Butch do? Remember your first four responsibilities on a scene. You can see the 5 year old’s body caught in the strainer. Everybody wants to go now. Let’s go get him. Take the basic 5 steps. What am I seeing that can go wrong? What am I not seeing because I’m looking to quickly. Do I have a hands-on practiced plan for how I’m going to get my own people out? Do I have everything I need for my trained emergency plan to work? If I’m not sure how I’m going to get the 5 year old out – then the statement has already been made that I don’t know how I’m going to get my own people out. 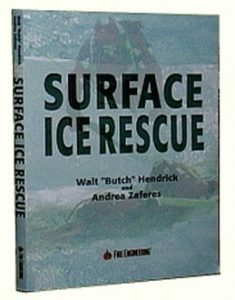 Rescuers often get hurt and sometimes even die in scenarios that have been practiced a dozen times. If he didn’t have a practiced plan of how to get his own people out would Butch put you in? Look at the reality of the situation and how often have we endangered our own when we didn’t have to – when we didn’t have a plan. We talk about risk/benefit, but very seldom do we analyze how we’re going to reduce the risk. 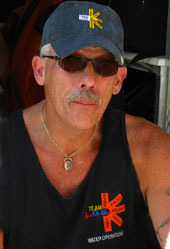 We don’t often look at the situation and ask “what needs to be done here?” It’s like training for moving water diving. We too often don’t look at the reality of an emergency situation. Train the contingency plan over and over again, every time, so that it becomes a natural part of what we do. Incorporate the contingency plan as part of the standard procedure and understand its reality. 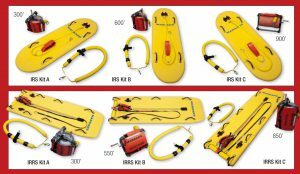 Why would I continue wearing sport dive equipment when I want to be recognized as a professional and want to perform the professional job of public safety diving. 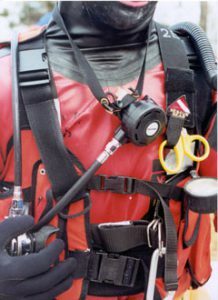 The octopus was designed for sport diving in water with good visibility and when diving midwater with a buddy, which is a far cry from the blackwater, entanglement covered bottoms, and solo-tethered-tender-directed procedure of public safety diving. 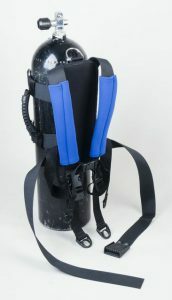 The pony bottle was designed for professionals or technical divers who require a true alternate air source. The octopus is just an alternate mouthpiece off a single gas source. It will do you no good if you run out of air. 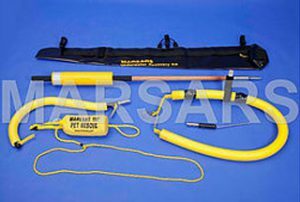 It will keep you stuck with an out-of-air entangled diver. It will worse a downstream regulator problem as switching to an octopus when your regulator is free flowing will cause a greater air loss and can cause a first stage freeze up. The octopus has no place in public safety diving.